Filorga Time Peel (Normal Skin) is a chemical peel that helps to improve the skin’s appearance. This chemical solution is designed for patients with uneven skin texture and tone. It can be used to treat a range of skin conditions such as wrinkles, aging, and dull skin. Through the use of Filorga Time Peel (Normal Skin), skin texture and tone will be significantly improved and the patient’s skin will appear more radiant. Carrying out an aesthetic treatment with Filorga Time Peel (Normal Skin) offers patients a non-injectable option to rejuvenate their skin. The chemical solution injures the skin in a controlled manner to encourage new skin growth and greater complexion. It contains ingredients that effectively exfoliates and revitalizes the skin. The two active ingredients are glycolic acid and gluconolactone. The alpha hydroxy acid (AHA) glycolic acid works by removing the uppermost layers of dead skin cells. This exfoliating process helps to stimulate the growth of new skin cells. Gluconolactone has antioxidant, moisturizing, and skin conditioning properties. This naturally occurring polyhydroxy acid (PHA) forms a barrier on the skin that maintains skin moisture and prevents further moisture loss. The two active ingredients create a skin rejuvenating solution that is suitable for normal skin types. Proper use of Filorga Time Peel (Normal Skin) results in fresher and younger looking skin. Filorga Time Peel (Normal Skin) is a product of Laboratoires Filorga. The internationally recognized French skincare company was founded in 1978 by Michel Tordjman. Laboratoires Filorga offers a range of medical anti-aging solutions, over-the-counter cosmetic products, and skin perfusion products. 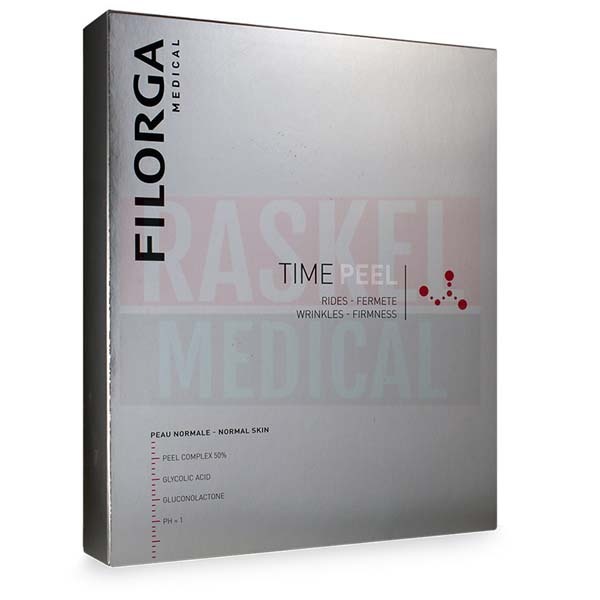 Filorga Time Peel (Normal Skin) is for external use only. Protect the patient’s eyes and other mucous membranes from direct contact with the chemical solution. After the treatment is done, patients should avoid sun exposure for at least two days and wear sunscreen to protect their skin during the healing process. Patients undergoing a chemical peel treatment using Filorga Time Peel (Normal Skin) may experience skin reactions. Possible side effects include: itching, redness, skin lesions, flaking skin, rash, and edema. Use Filorga Time Peel (Normal Skin) after preparing patient’s skin with a pH balancing pre-peel formula like Filorga Pre Peel for best results. Start with applying Filorga Pre Peel on the patient’s skin using a cotton pad or compress. Next, dispense approximately 3ml of Filorga Time Peel (Normal Skin) solution into the dispensing tube. Then, use the brush to apply the chemical solution onto the patient’s skin and let it sit for three minutes. Follow this with the application of Filorga Post Peel to neutralize the solution. Apply the post peel formula using a cotton pad or compress. Finally, clean the patient’s skin with a wet cotton pad or compress. The recommended treatment schedule is four treatment sessions, each two weeks apart. This may be adjusted according to individual patient’s needs. 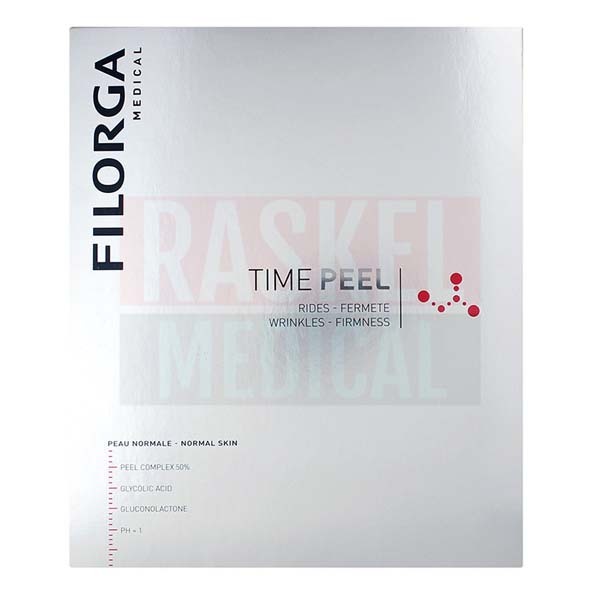 Filorga Time Peel (Normal Skin) is a peeling complex of glycolic acid, gluconolactone, sodium lactate, and water, pH ≈ 1. The two active ingredients are glycolic acid and gluconolactone. 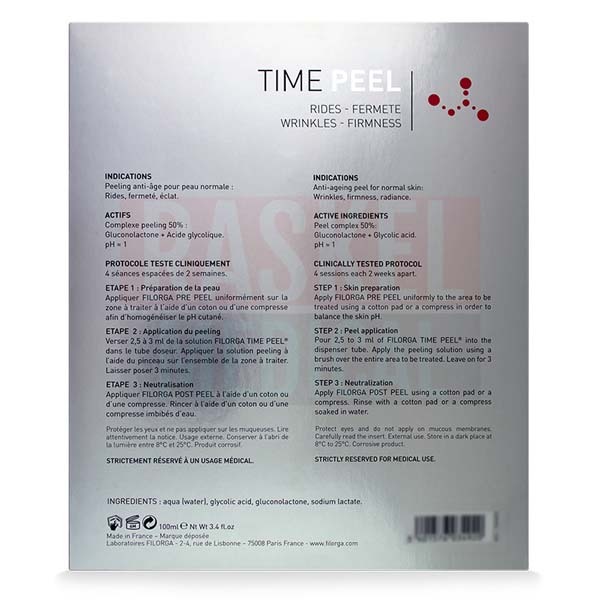 The effects of FilorgaTime Peel (Normal Skin) are temporary. After completing a full treatment schedule, patients may continue with maintenance treatments for more long lasting effects. Store this product in a dark place at temperatures between 8-25℃.